Born in Chile, but raised in NJ, Alex began his musical career playing trumpet in various school bands. After dabbling in classical guitar and piano, he taught himself to play electric bass after a long infatuation with the prominent bass lines in the music of Yes, Rush, The Who and others. While pursuing BS and MS degrees in Electrical Engineering, Alex developed a taste for Jazz, playing in several different ensembles. It was at this time that he was inspired by the revolutionary playing of Jaco Pastorius to pick up the fretless bass. 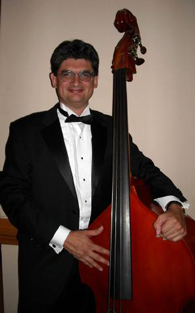 Several years later after a long stint in a Jazz Quartet came to an end, he decided to venture into the world of upright bass, studying with Greg Cohen. Over the past ten years, his abilities on different instruments and familiarity with different genres has led to a variety of steady gigs ranging anywhere from intimate Jazz trios to pit orchestras and Big Bands. Alex lives in Hillsborough, NJ with his wife and two daughters.